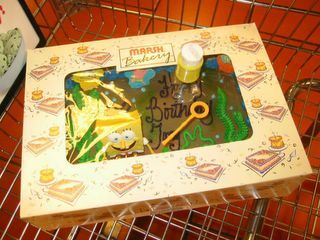 If you need to buy a cake for a man’s 24nd birthday, do not buy a Spongebob Squarepants birthday cake. There is something fundamentally odd about doing so – particularly when the birthday boy in question isn’t a fan of the cartoon and there is no “inside joke” about the cartoon that would give you a good reason for using it as a cake theme. If you are picking up such a cake as a favor to a relative (who did not tell you what the cake was going to look like in advance), it is best to lie about the age of the recipient when conversing with the cake decorators in the bakery if the subject comes up. If you have already said “There must be some mistake – this cake is for a 24 year old guy!” to the bakers, do not reveal your real name and try to leave quickly before their laughter reaches you. Previous PostPrevious Thank you Dr Biggles! My 35-year-old husband would LOVE that cake! I will acknowledge that some people will like this cake. Particularly if they have a sense of humor (which was, unfortunately, not the case with this one). And I must say that it didn’t taste too bad in the end. Maybe you could have worked on Spongebob with a soldering iron or something. Add some molded wax and some paint. Make an evil Spongebob, with chains and spikes. Then sprinkle tacks all over the cake, set a fire cracker off in the center then put a red candle in the center and let it drip and run down everwhere. NOW THAT’S A BOY CAKE !!! He rejects authority and spends his time hanging out behind the liquor store. Tattoos, leather spike necklace and half empty bottle of Jack D. included. Trashy girlfriend and other accessories sold separately.